This is similar to the tropcial tsunami but is blue instead of green. Same compact size and will fit in just about any backyard. 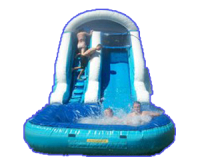 This water slide rental is a ton of fun for ages 2-12yo, no adults or teens sorry. This unit needs 30 ft in length 17 wide and 14 tall to fit in your back yard. Give us a call to reserve.